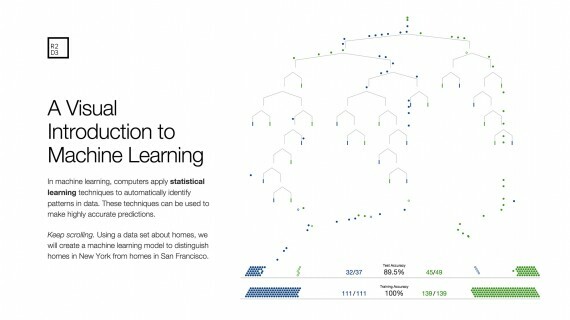 Machine learning is a complex and abstract technology in which computers learn to identify patterns in data. Over the past few years, it has made possible many innovations such as self-driving cars, ‘smart’ thermostats, and voice recognition. This project lets readers learn how this technology actually works. This project uses interactive data visualizations to propel readers through a carefully paced narrative. The narrative begins with basic mathematical intuitions and builds up to an actual machine learning model through step by step conceptual illustrations. With each scroll, the graphics move and illustrate new concepts, creating for the reader a sense of both satisfaction and suspense. Through the project’s use of scroll-linked animation, readers retain fine control over the pace at which they explore the material. Thus, they can examine the connections between concepts and absorb the concept at hand at their own pace. This project showcases the beauty of not only data but also the methods used to extract insights from data. Readers responded with delight. “This is how all subjects should be taught” was a common piece of feedback. The project was widely shared among social media communities in data science, data visualization and machine learning. Many professors actually asked if they could to include this piece in their curricula. In the months after its launch, there were over 250,000 visitors to the site. Of these, 60% were from outside the US. The average visitor stayed on the page for about 8 minutes, and ~80% of visitors scrolled to the bottom of the page. The project introduces machine learning to a non-technical audience, thus condensing concepts that typically require years of mathematical and technical training into something that is both inviting and accessible. By making machine learning visual, and thus visceral, this project makes the complex concepts underlying it accessible to a popular audience and instills an innate appreciation for their beauty and power.